What sets us apart from the competition? Easy to operate, innovative features, highly customizable and affordable! Stream Breeze offers a wide variety of systems. Have you wanted to add affordable portable video production with live switching and streaming to grow your audience but didn’t know how to begin? Do you have an organization that would be enhanced by video streaming, perhaps a church, school, sports club or performance venue? Take your message to the WORLD! Homebound viewers who cannot make it to a church service or ballgame. Business Colleagues anywhere in the world. Entertainment fans who aren’t able to attend a performance. Students who cannot attend a class. Now you can add these to YOUR target audience and you CAN reach them using the internet and video streaming! Perform live switching and streaming with a small footprint of equipment. It is affordable portable video production made easy. 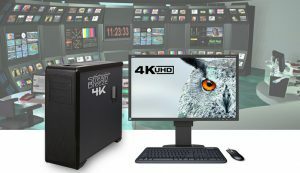 Have you made the move to 4k production yet? If you have 4k cameras or content and are in need of a Live Switching/Streaming/Editing solution then the NEW Stream Breeze 4K is for you! Featuring a powerful UPGRADEABLE PC base running the latest vMix software, this system easily competes with solutions costing thousands of dollars more. Switch up to 1000 sources, use 4 LIVE inputs, title, overlay, picture in picture, remote videocall, scoreboard and more can be added to your production while you LIVE STREAM the entire event to the internet! Easy enough for even non-video geeks to operate! Full support is included to get you started and you have the peace of mind of using an industry standard interface and rock-solid dependable hardware. Don’t Get Boxed In! Have a live video production switcher done YOUR way! At Stream Breeze, we let you think OUTSIDE the box. Unlike some other manufacturers, we can custom configure your Stream Breeze system to your exact needs so you are not stuck with a one-box-for-all product! Hi-Tech Enterprises, Inc. offers a full line of dedicated Multi-Camera Live Switching and Streaming systems. From our new 4k system to the entry level Stream Breeze Flex to the enhanced Stream Breeze Pro to the versatile Stream Breeze Broadcast through our Instant Replay system, the Stream Breeze Echo, we have a wide variety of fully customizable systems to suit your production needs. Learn how streaming can enhance YOUR business! Stream Breeze video production systems are perfect for Sporting Events, Houses of Worship, concerts, plays and other live events that you wish to share with a larger audience. We also RENT systems so that you can try before you buy, or simply use one for a short amount of time as needed! Call us today 727-573-9600 to schedule a Live Demo! 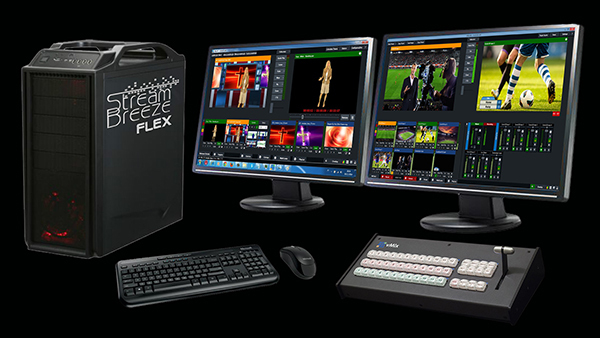 The Stream Breeze Flex model is our most popular and affordable live video streaming solution. Perfect for Churches, Schools, Sports clubs, Corporate Learning, Distance learning, Podcasters and more. The Flex allows you to combine up to 4 live cameras with video clips, titles, overlays and more. The Pro offers professional broadcast standard HD-SDI / SD-SDI inputs (and optional outputs) which have the advantage of allowing much longer camera cable runs than HDMI. Perfect for sports, events, houses of worship and educational markets. The Broadcast features 8 HD-SDI (or SD-HDI) professional broadcast standard inputs in a rack mount enclosure. Perfect for larger installations with longer distances from cameras to switcher as SDI cables can be run up to 300′ as opposed to HDMI’s 40 feet limit. Designed from the ground up for replaying of events where high-quality HD video and reliability are top considerations with a price point that won’t break the bank, Stream Breeze Echo video production switcher offers four input variable speed slow motion instant replay system with iso recorder. The Stream Breeze Bolt model is our Portable Multi-Camera Video Production & Streaming solution. Perfect for Webinars, Corporate Learning, Distance learning, Podcasters and more. The Bolt allows you to combine up to 4 live cameras with video clips, titles, overlays and more. The One allows you to combine 1 live camera (or switcher output) with video clips, titles, overlays and more. With built-in effects, virtual sets, chroma-keying (green screen), picture-in-picture, animated lower thirds, titling, graphics, editing software and streaming output capabilities it has everything you need to start (or expand) your own video production studio. If the pre-built video production computers don’t quite fit the bill, you can create a custom-built system that does! Available are a wide variety of options to ensure that you have what you need to do the job, and they are all versatile enough to perform a variety of functions from Live Event switching and streaming to editing and authoring DVDs. Exciting New Vmix Version 18 Features!